The OS usage rates seen by the free Hockey Scores application is almost identical to the rates recently published by RIM. 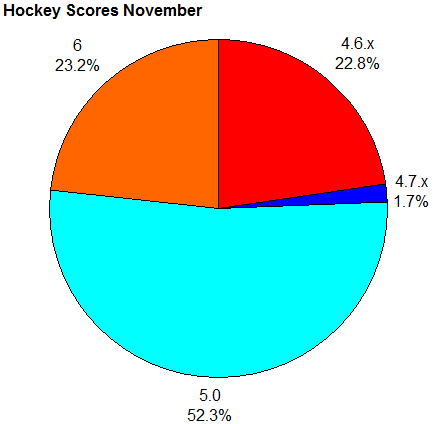 The Hockey Scores application does not support OS 4.5 with most of this percentage being absorbed by OS 4.6.x instead. The other values of 1.7% for OS 4.7.X and 75.5% for OS 5.0 and higher are extremely close to the numbers the RIM published. The additional statistic that can be seen here, that is not shown in RIM’s numbers is the breakdown of OS6 and OS5 devices. OS 6 is currently on about 1 in 3 devices running OS 5 or higher, and about a quarter of devices over all. Given that these numbers are already a bit dated, and RIM’s push of OS6 on in market devices has been slow, it is reasonable to believe that the OS 6 adoption numbers have the potential to be much better. It is reasonable to assume, that OS 6 will be on half the devices on the market within a month of it being pushed on current devices and the 93xx by all carriers.